Most of us think of “home” as our castle, and our greatest asset. Your investment in outdoor spaces should be protected, whether it’s a single window awning, an umbrella, a vast array of awnings, or a yard full of outdoor furniture. Waiting until your outdoor fabrics look unflattering is a choice, but we recommend regular maintenance to help keep them looking good for as long as possible. Let us restore and maintain the beauty to your outdoor fabrics to be the best they can be…a beautiful reflection of your lifestyle. We also clean banners, flags, boat covers, tops & enclosures, boat cushions, sails, and race trailer covers! Cleaning awnings may seem fairly basic, but anyone who’s ever tried knows it’s not as easy as it appears. Let us take care of the dirty work. At Awning Cleaning Industries, we wash every fabric by hand, giving extra attention to stubborn stains. We also inspect each item to identify if and where repairs are needed. Your outdoor fabrics can once again look attractive, creating a beautiful, relaxing atmosphere for your enjoyment. Our most popular service offering is, “Send us your dirty fabrics and we will return them to you cleaned and treated!” Awning Cleaning Industries provides top quality cleaning and repairs year-round for your outdoor fabrics. Most fabrics look better and last longer when they are cleaned periodically. We clean all fabrics by hand, using gentle but effective methods and APCO products that are formulated especially for us. Our methods and procedures are proven to remove mold, mildew, bird droppings, environmental dirt, and soil that results from everyday use. Let us restore the beauty to your fabrics and make them the best they can be – a true reflection of your lifestyle. Awning Cleaning Industries has a fully insured warehouse, where your awnings can be stored for the winter season. We tag each item and place them in our clean, temperature controlled, safe storage area, waiting for spring. In the summertime, we offer storage and cleaning for your winter awning covers, pool covers, and boat covers. For many homes, awnings are seasonal; up in the spring and down in the fall. This was our original service offered at ACI. Since we opened our doors in 1983, we have provided professional put-up and take-down services to customers within our local service area. At the same time, our experienced crews keep a watchful eye on the overall condition of your awnings, providing repairs on the spot when possible – such as patching, reroping and repairs to frame or hardware. If the fabric requires stitching, we will remove it and return to rehang it after our in-house repairs have been completed. For optimal awning longevity, we suggest our seasonal awning put-up service in the spring, take-down service and storage in the fall, and cleaning every other year. Retractable awnings may be cleaned on-site if they are less than five years old, not excessively dirty, accessible, and located within our local service area. The service includes washing of the fabric, wiping down the frame, operational review, inspection of connecting hardware, lubrication where appropriate, and leveling of the front bar when possible. In some cases on-site cleaning is not possible for several reasons, including fabric repair or heavy buildup of dirt or mildew. Our option here is to remove the fabric, service it at our facility and return to install when complete. Our expert sewing department has become an asset to many of our clients. 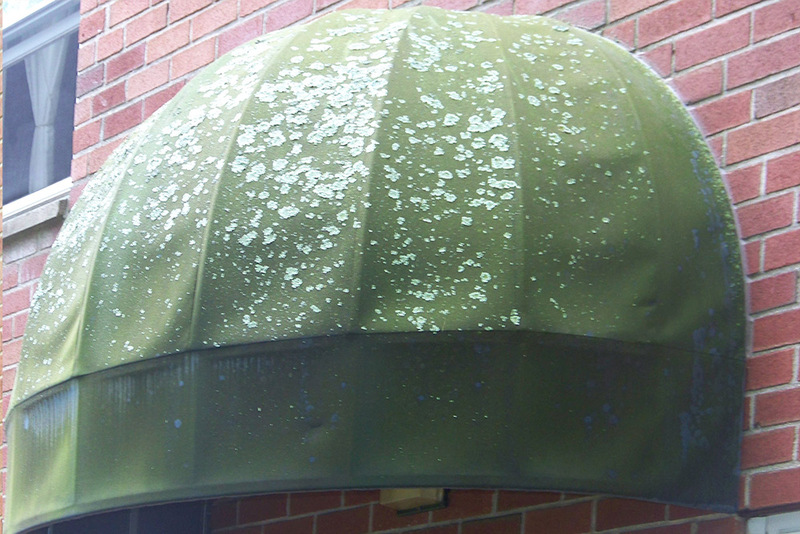 Should your awnings become too old to service, or if you are ready for a change of color or style, our sewing room can produce replacement covers for you. If you would like a brand new awning for a window, doorway or deck, let us provide you with all the awning services you need. Select from a wide variety of fabric colors and patterns from the best manufacturers. All our covers are custom made, and include a lifetime stitching warranty. Contact us for a quotation. 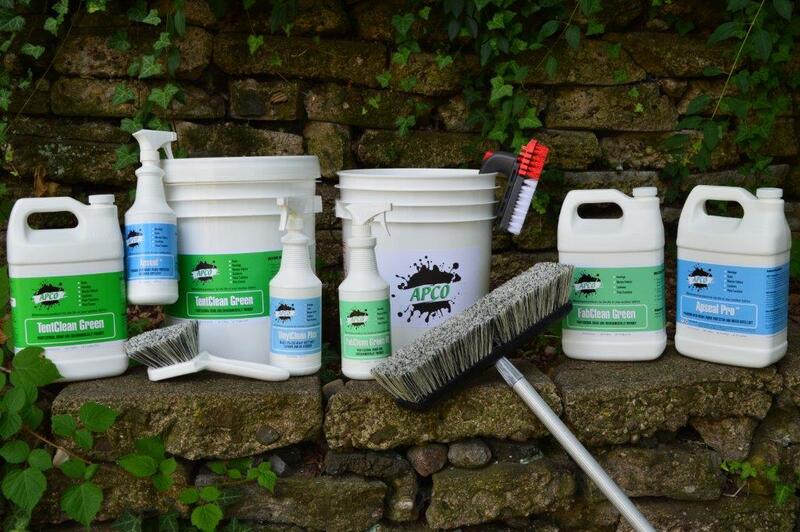 Our professional line of APCO cleaners and protectors which have been specially formulated for us, are available for purchase. These products give you the option of cleaning and maintaining your outdoor fabrics yourself.